Thus, Depreciable cost = Cost of assets - Salvage value = 10200-0 = 10200. Deprecciation per month = Depreciable cost / Number of months = 10200 /60 = $ 170. As per Question, Accumulated depreciation balance is $ 2040 which states the total depreciation accumulated from date of purchase to till date i.e. Jan 31, 2017. 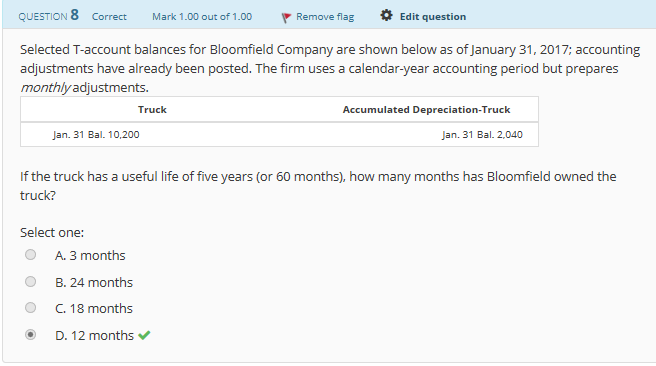 Therefore, Assets has been used for =Accumulated depreciation balance / Monthle depreciation = 2040/170 = 12 months.